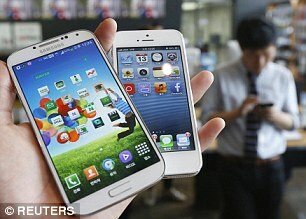 PHONE SETTLEMENT Handset makers Apple and Samsung have finally settled a seven-year battle over smartphones. It comes a month after a jury concluded Samsung owed Apple £400million for copying some of the iPhone’s innovations in some of Samsung’s competing products. ENERGY PAYOUT The supplier SSE has paid out £190,000 in compensation after it withdrew from a partnership with social enterprise Ebico, and failed to quickly move customers onto another tariff. Suppliers have 49 days to move customers onto a new tariff if the one they are on is withdrawn. SSE took almost six months. SALES RECORD The owner of Webuyanycar.com has told its suitors that ‘the ball is in their court’ as it released record results today. BCA Marketplace, which recently rejected a £1.6billion takeover bid from private equity firm Apax, announced today that its revenue for the year ending in April was up 19.8 per cent to £2.4billion. Its profit hit £87.6million. SLIMMER APP Facebook-owned Instagram has launched a new version of its picture app aimed at the developing world. It is designed to work on older devices with reduced access to the internet. ROBOT TRIAL A robot that can make phone calls for users – for example booking tables on their behalf – is being trialled by Google. CRITIC REBUFF Chinese telecoms giant Huawei has claimed criticisms of its links with US universities are ill-informed and go against academic freedom. CHIEF OUT The City’s Brexit chief, Jeremy Brown, is stepping down from the City of London Corporation amid uncertainty over the deal UK financial services will get with the EU post-Brexit. CRYPTO CAUTION The Bank of England has told bosses to take care when investing in cryptocurrency assets such as Bitcoin amid fears it could expose them to money laundering and terrorist financing. TAKEOVER DEMAND Disney may have to increase its offer for Sky if it buys Fox, the Takeover Panel said yesterday. Disney vowed to match Fox’s bid of 1075p per share for Sky, but, as it has since offered to pay more for Fox, regulators may force it to hike up its Sky bid also.